Crush the biscuits finely, either in a polythene bag or in a food processor. Melt the butter then mix it with the biscuits and sugar. Press into the base and sides of the ring or dish. Chill in the refrigerator until firm – at least 2 hours. 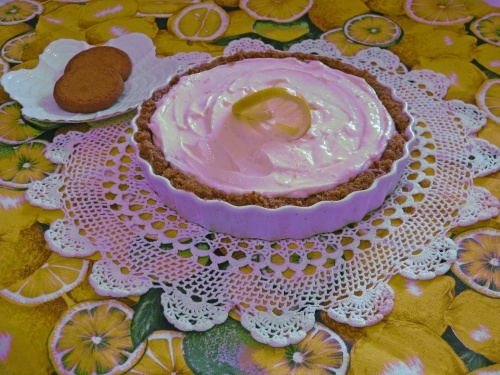 Stir the grated rind of 1 lemon and the juice of 2 into the condensed milk then fold in the cream. This thickens quickly so pour immediately into the biscuit base. Leave to set completely in the refrigerator. NOTE: when cutting one of the lemons for juice, cut a thin slice from one half and put on one side for decoration later.